Isn't hedonism heavenly? Indulge in the simple pleasures of life with this luxurious 'Sasha' bag by DG Dolce and Gabbana™. Free shipping in the USA. Clutch style handbag made of leather. 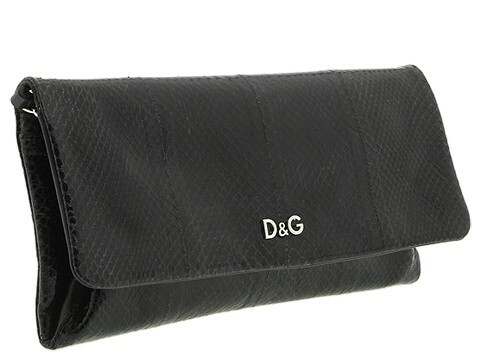 Holds your wallet, keys, lipstick and a slim cell phone. ; Dimensions: 9 1/2 wide across bottom, 9 1/2 wide across center, 9 1/2 wide across top x 1 1/2 deep x 5 high. Single shoulder chain. Shoulder drop: 20 length. DG ornamentation. Platform bottom. Top flap with a magnetic snap closure. Interior lining with a multifunctional pocket, coin pocket with kiss lock closure and card carrier insert. 13.00 oz.